Fifth Judicial District Court Judge Kimberly Wanker has recused herself from the case involving the possible delay of the appointment for the Nevada Assembly District 36 seat. 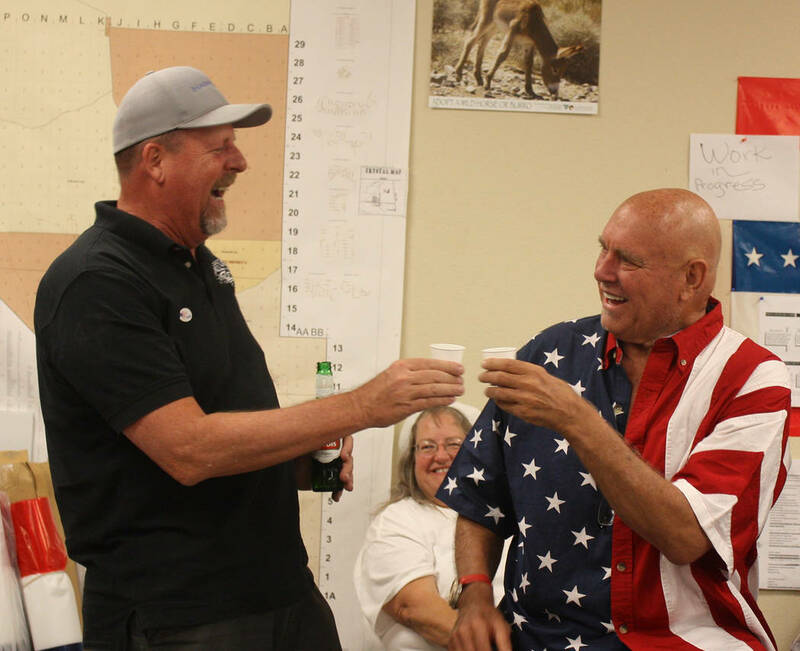 Special to the Pahrump Valley Times Former Nevada Assembly District 36 representative Ed Goedhart is shown congratulating Dennis Hof on his primary election win. Hof passed away before ultimately winning the general election for Assembly and Goedhart is now striving to stall the appointment of whomever will fill Hof's seat. Robin Hebrock/Pahrump Valley Times The latest round of paperwork filed in the lawsuit to delay the Nevada Assembly District 36 appointment included a recusal order from judge Kimberly Wanker and a request for an emergency hearing by Ed Goedhart. The lawsuit, filed by Ed Goedhart on Nov. 27, requests that the courts bar the currently sitting Nye County Commission from making a selection for that appointment, so as to allow the newly elected commissioners, who will take their seats in 2019, to make that decision. At this time, the Nye County Commission has scheduled a meeting for today, Dec. 5 to pick its nominee for the position and on Dec. 7 the board is set to hold a joint meeting with the commissions of Clark and Lincoln counties in order to make the appointment official. As a Nye County resident and voter, Goedhart argues that he and the people of Nye County Districts 4 and 5 will not have proper representation in this matter if their newly elected commissioners are not part of the appointment process. 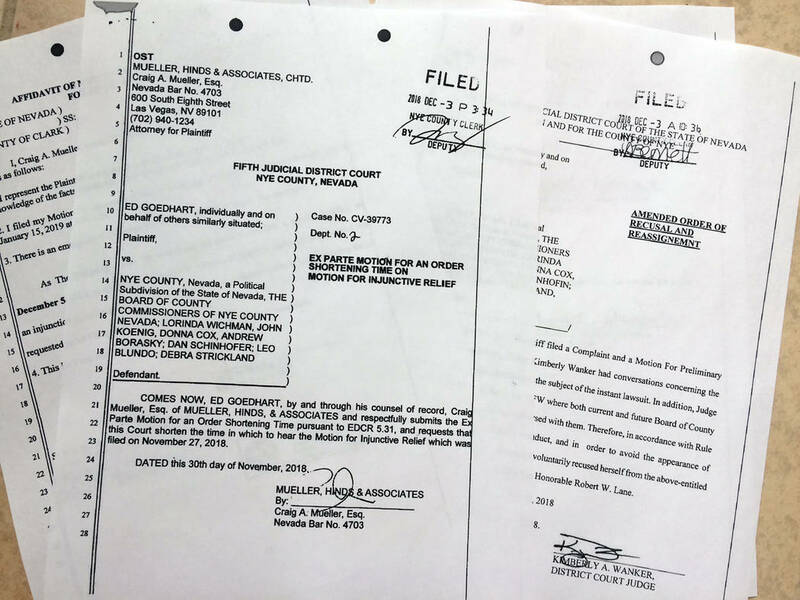 The case was filed in Fifth Judicial District Court Department 1 but on Nov. 30 Wanker filed an order of recusal and had the case shifted over to Department 2, to be presided over by judge Robert Lane. Goedhart said he was certain that Wanker had made the right decision. In an amended order of recusal filed the following Monday, Dec. 3, Wanker provided an explanation of the purpose for her recusing herself. As he vowed, Goedhart and his attorney Craig Mueller filed a second document with the court, which was also recorded on Monday. In this filing, Goedhart asks judge Lane to host a hearing as soon as possible, as the commission meeting to make the appointment is looming. Nye County did not appear to be disquieted by the attempt at legal action. Lane set a hearing for 9 a.m. on Dec. 19.